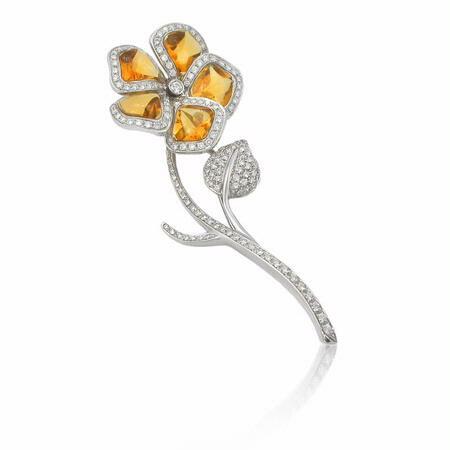 This gorgeous GARAVELLI 18k white gold brooch pin, contains 5 citrines of exquisite color and round brilliant cut white diamonds of F color, VS2 clarity and of excellent cut and brilliance, weighing 1.75 carats total. Mario Garavelli was well known for the quality and originality of his craftsmanship. The same innovative techniques are applied to the design and superior manufacturing at Garavelli today. The brooch measures 3 inches in length and 1 inch wide at the flower.